Burnley are hitting the restart button on their season after the international break. The Clarets have played 10 competitive games so far this season, after three qualifying rounds in the Europa League added to their Premier League commitments. And they are still searching for a first League win of the season, suffering three successive defeats. Burnley go to Wolves on Sunday focused purely on the bread and butter of domestic football, and while Dyche isn’t saying the season starts now, he hopes his side can pick up where they left off when finishing seventh last term. Asked about the break, Dyche said: “It's been good, we try to find the right balance between work and rest, which we did, and we’re quite happy with that. “It was good for us this time around, a lot of games and travelling, different challenges. “We could clear the mind. “The lads who stayed here had a few days off last week and worked again. “This one has been needed, to refresh physically and mentally. “I said to the lads it’s a restart because it’s been so different for us. “It you’re familiar to Europa and how it works, that’s different - for us it was new, something different. 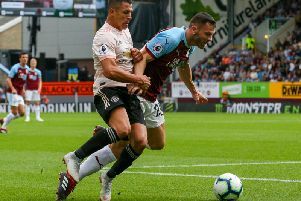 And Dyche hopes to have his options boosted in the coming games and weeks as Johann Berg Gudmundsson, Steven Defour and Robbie Brady get closer to full fitness: “Ben Gibson has got to see a specialist about a groin ache and pain. We'll find out more on that one. “Steven is doing really well, he’s been fit for a week and training with us every day. “He’s looking and feeling well, he’ll start a games programme next week, he’ll need a couple of games to build into it and build into a 90 minutes. He’s midway through a pre-season. “Robbie is back on the grass but only a couple of days in, he’ll maybe start his games programme slightly behind Steven. Stephen Ward missed Ireland’s game in Poland on Tuesday, but Dyche added: “He came back with a knock, he’s fine. Burnley face a tough test against a vibrant Wolves side who, after winning the Championship, claimed their first top flight win in six years last time out against West Ham. Dyche noted: “They’ve done very well. They invested wisely last season, added to that but kept a core. “They look a good outfit to me, a good mixture of real talented players, some pace and they’ve defended well.